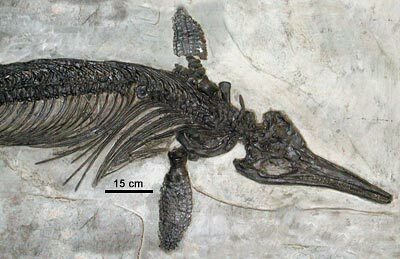 A specimen of the Jurassic icthyosaur Ichthyosaurus intermedius, found in Somerset County, England. Photo by Sara Rieboldt, © UC Museum of Paleontology. Some really cool information on ichthyosaurs has been put together by Ryosuke Motani, a former post-doc in Kevin Padian's lab. While dinosaurs ruled the land, the ichthyosaurs, classified variously in the Ichthyosauria or in the Ichthyopterygia, shared the seas of the world with the other great groups of large marine reptiles, the plesiosaurs and mosasaurs. "Ichthyosaur" means "fish lizard," while "Ichthyopterygia" means "fish paddle." Both names are apt. The earliest ichthyosaurs had long, flexible bodies and probably swam by undulating, like living eels. More advanced ichthyosaurs  like the one shown above, on display at the Senckenberg Museum in Frankfurt, Germany  had compact, very fishlike bodies with crescent-shaped tails. The shape of these ichthyosaurs is like that of living tunas and mackerels, which are the fastest fish in the ocean; like them, the later ichthyosaurs were built for speed. Note the paddles with which ichthyosaurs swam; they have the same basic plan as your hand and arm, but the arm bones are very short, while the fingers have lengthened by developing many more bones than the three that make up each of your fingers. The first ichthyosaurs appeared in the Triassic. In the Jurassic, ichthyosaurs reached their highest diversity, and then began to decline. The last ichthyosaurs disappeared in the Cretaceous  several million years before the last dinosaurs died out. Whatever caused the extinction of the dinosaurs did not cause the ichthyosaurs to die out.